When looking for an office space in Singapore, cost is often a huge deciding factor. 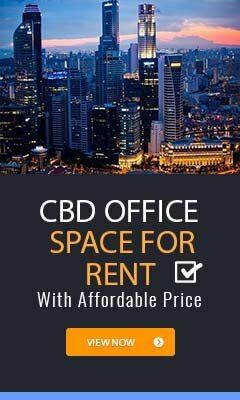 Singapore Office rental rates vary significantly between districts and even locations within the same district, particularly in Singapore CBD, so it can be difficult to know how much you should be paying when come to office leasing in Singapore. This Singapore Office Rental Rates Guide provides businesses an idea of the average monthly rents of each district helping businesses narrow down the areas they should be focusing with their rental budget. For office spaces, the rent is calculated per square foot, so you will be charged X amount per square foot per month. So, what is the average rental rates for an office space in Singapore? The average Singapore office rental rate varies between buildings, locations and districts, averaging from $2.92 to $7.97 per square foot per month as of Jan 2019. The most affordable locations for rental office space in Singapore are Upper Bukit Timah in District 21, Katong and Marine Parade in District 15, and Geylang in District 14. At the other end of the scale, the most expensive areas include grade A office buildings in Marina Bay and Raffles Place of District 01 within the CBD, where rental rates reach $11.00 per square foot per month on average. Within the Singapore CBD, there are areas where you can secure an affordable office lease. While Raffles Place and Marina Bay new financial district command high rents, you can find great deals in Tanjong Pagar and Cecil Street. Apart from location, there are a number of other factors that affect Singapore office rental rates, including age and maintenance of building (i.e. grade A, grade B and grade C buildings), specifications of office space, size of office space, tenant mix in the building and amenities. Not sure about the differences between grade A, grade B and grade C buildings? What about the ideal floor area and lease term, and the rental rates of each building? To better understand the complexities of the office space rental process, check out our article – The Singapore Office Rental Guide For New Tenants and let us recommend an office real estate agent to assist you. Why tenants prefer our recommended office real estate agent? Complete this form and let us recommend you an office real estate professional now!